Mini Cirque is a group of enthusiastic and professional entertainers; children bond easily with them and adults will remember their experience for a long time. Each performer comes from a different performance background in the circus arts and each brings a special aspect to the whole. Sophie has been performing and teaching performing arts since the age of 15 in 1990. It began with her love of dance, training extensively in many different forms of dance, and dancing professionally for 2 years. 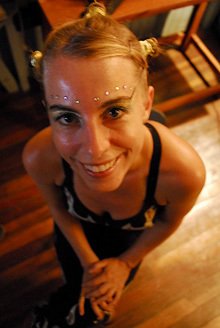 While taking a break from the dance world, travelling for 3 years in North and Central America, she met several circus troupes who made lasting impressions. During one of these encounters she discovered poi, the Polynesian art form of spinning balls at the ends of strings, which could also be performed as spinning fire chains. From her first encounter with fire poi, she knew it was something she was going to do. Mostly self-taught, sometimes exchanging with other artists, Sophie has always pushed the limits to see just how far the techniques and artistry of poi could be taken. 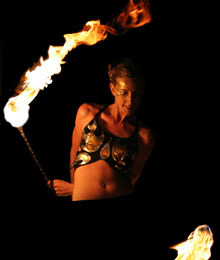 Expressive by nature, blending poi and dance, her aspiration for creating original pieces of art has resulted in highly unique and dynamic fire performances. 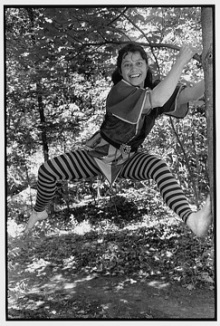 2001 was the start of Sophie's performances with local circus groups. In 2003, she met Amber Robson, also a professional fire dancer, and together they created Fire Weavers performance troupe. Every year these two women create a new and more spectacular fire show seen at all types of events. This impressive fire show has won national awards as well as rave reviews. Sophie's exploration of other types of circus arts such as juggling, hula hooping, flower-sticks, clowning and acrobatics, culminates in the creation of Mini Cirque, a group of artists that animate events and teach circus skills in various schools. Sophie now makes her living solely as both performer and teacher in the circus arts. Brigitte has been in love with hoop dance since her first encounter with this art in 2006 and has passionately trained and honed her technique and presentation over the last few years. With a strong background in figure skating, training under world renowned coaches and choreographers, she brings grace and fluidity to her intricate hoop manipulation and delivers energetic and engaging performances. 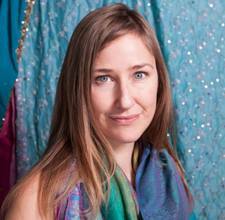 Brigitte is an avid hoop performer and instructor teaching regular classes in the Ottawa area. You will also find her bringing her car full of different size hoops to special events ready to entertain and deliver workshops for all ages. Brigitte performs professionally with the hoop both as a solo artist and in duet choreographies featuring spectacular LED glow hoops and fire hoops and fire fans. Amber is a professional fire spinner with many years of experience. Her diverse background includes many forms of movement including African dance, martial arts, and yoga. Amber’s ability with the staff is inspired from her baton spinning days with a city marching band as a young girl. Amber hypnotizes the audience with her fluid grace and the intricate movements of her tools. Before the creation of the Fire Weavers, Amber performed with Ash Circle of Nova Scotia, and Gaïa Fire Dance of Saskatchewan. Amber Robson has been performing with the Fire Weavers since 2003 and has since been a pioneer of the art-form - she was one of the first performers in North America to perform with a fire hula hoop! In 2008, she took a break from fire dancing and life in Canada to spend 7 months studying Argentine tango in Buenos Aires. Tango has brought new passion and creativity to her as an artist and she recently picked up her fire tools again especially for 2010 Lumiere festival. Self-taught artist of many talents, Sylvie designs her own numbers, costumes and most of her stage accessories. After thirty years of performances, she now devotes her skills to directing and teaching performance arts in school. Her name is in the repertoire of Artists in Schools, a Quebec government program that promotes arts and culture in schools. She has been an important part of the Mini Cirque team since its early days. In addition to these artists above you find among them: Jean-Guy Beaudry, juggler and unicyclist, Yoshi the juggler, Andrée Rainville, Vincent Polinquin-Simsand our local up and coming circus artists Anne Hamels, Ally Ling, Adrien Malette-Chenier and Joel Paulin, Delphine Benazet and Charles Gareau, as well as many more performers. The Mini Cirque members have worked in various schools, daycares, museums, shopping centres, hospitals, resorts, retirement centers, parties, fairs and festivals in the greater Ottawa/Gatineau area, the Montréal area, as well as in many countries abroad.